The full extent and range of the self-care that we all could (and should!) be undertaking is described by the “Seven Pillars of Self-Care” framework. Over the last few years this framework has proved to be both robust and useful in helping to describe self-care activities in many situations. A book from Portuguese nursing college ESEP entitled ” A Pessoa Dependente & O Familiar Cuidador ” ( The Dependent Person and Family Caregivers). Multiple organisations in Canada that run International Self-Care Day programmes each year. The seven pillars framework is more than just a visual diagram; it can be used to list specific activities for self-carers. This is useful in helping people to get to grips with the wide extent and range of self-care activities. For example, the White Ribbon Alliance lists examples of Maternal, Newborn and Child Health under each pillar. Having a coherent and ‘holistic’ understanding of self-care, as illustrated and categorised in the seven pillars framework, is important not least to patients. It is known that unhealthy behaviours – smoking, excess consumption of alcohol, poor diet and insufficient exercise – tend to ‘cluster’ together in individuals and in particular parts of a population. An interesting issue is the extent to which healthy behaviours in the seven pillars also cluster together. The implication is that if a person is motivated towards one healthy behaviour (e.g. quitting smoking), then they may also be more strongly disposed towards others healthy behaviours, such as losing excess weight or exercise. The seven pillars framework, as a holistic description of self-care, lends itself to further research looking at potential synergies between the pillars. 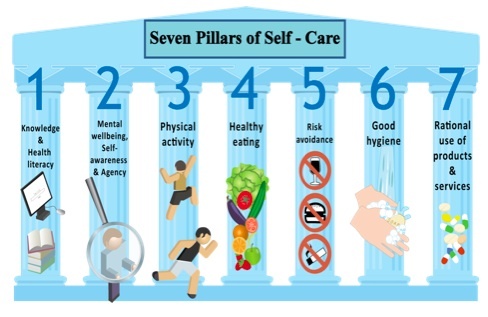 It should be emphasised that while the seven pillars framework is designed to describe the entire range of self-care activities, individual circumstances and country conditions mean that self-care practices vary considerably around the world. Self-care practices in resource-poor countries are inevitably somewhat different to those of richer countries, for example. But there are few circumstances in which people should not consider their (and their family’s) health and wellbeing, and try to move in a positive direction.